Assistance League is a national nonprofit organization that is transforming lives and strengthening community through locally based philanthropic programs. Founded by Anne Banning and Ada Loughlin in 1919, Assistance League was the first nonprofit, nonpolitical, nonsectarian organization founded in the West to recognize the potential of volunteers in helping those less fortunate to a better, more meaningful life. Today, chapters across America address emotional and physical needs of children and adults of all ages regardless of race or creed. 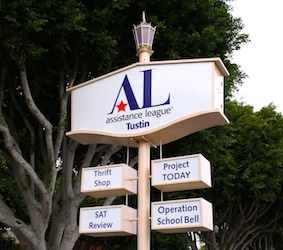 Assistance League of Tustin volunteers have been dedicated to helping the less fortunate and serving our local community since 1965 – we are proud to be in our 53rd year of helping the greater Tustin community! Last year, the Assistance League of Tustin and it’s Assisteens Auxiliary celebrated over 20,000 hours of volunteerism in our community. We were able to help over 16,000 local children and their families by raising over $325,000 through sales at our Thrift Shop and financial gifts given by our generous supporters. Donations from friends like you help us continue funding the year‑round community projects that make a difference in the lives of families, adults and children who are in need. To donate directly and securely through PayPal, click the Donate button below!